Humanity in the Holocaust: Irene, the inspiration and a lesson for everyone . . . In the latter category, Irena Sendler. The name might not be familiar, but Irena Sendler’s sacrifice deserves the highest recognition. Had it not been for her and her selfless deeds, humanity’s darkest days would have been even worse. 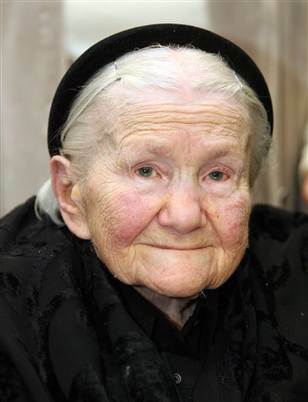 She never considered herself as such, but Irena Sendler is an inspiration. Unfortunate enough to find herself in Warsaw, Poland on September 1, 1939 – the day the Nazis came – the heroic health worker refused to stand by and watch. Some succumbed, others – understandably – saved their own skins. Not Irena Sendler. You see, adamant that she would not just bear eye-witness to the Holocaust, she stood up to those responsible, defying them and thwarting their efforts at each turn. Irena suffered for her stand, the torturers’ scars enduring for the remainder of her days. Despite the excruciating pain, she always believed it had been worth it. Irena’s achievement, to smuggle around 2,500 children out of the Warsaw Ghetto, where 450,000 Jews – 30 percent of the city’s population – had been imprisoned behind walls seven feet high. Those inside the Ghetto, forced to exist in unimaginable conditions (around 5,000 died each month from starvation or disease), had been earmarked for extermination. The Nazis succeeded in murdering six million Jews (including 1.2 million children) during the Holocaust. Irena ensured that some, at least, escaped the horrors. Forming a network of like-minded volunteers – most of them women – she set about smuggling babies, children and teenagers out of the Ghetto and beyond the Nazis’ clutches. Some, they spirited out in coffins and body-bags intended for those less fortunate. One baby was carried out in a mechanic’s toolbox, others in sacks and suitcases. Some crept through the sewers, others hidden in a van, the driver’s dog trained to bark noisily, in order to mask their cries. Irena Sendler organized all this. It is little wonder the Nazis mistreated her so. Suspecting that she conspired against them, they took her to Pawiak, a brutal Gestapo-run prison, and tortured her. Her resistance steadfast, she refused to give up the network, even if it meant her own life. It almost did. The Nazis sentenced Irena to death, but this time she was on the receiving end of a rescue, her colleagues spiriting her to safety. Most would have given up at that point, but not Irena, who assumed a new identity and got back to work, listing the name of each child saved on a piece of paper that she buried in a jar in a friend’s garden. Come the end, the list contained 2,500 names. The Nazis gone, Irena tried to reunite those on the list with their families, although most of the parents had been gassed at Treblinka. Rather than take pride in her astonishing achievements, she spent her later years wrestling with her conscience. Irena died in 2008 – aged 98 – having spent her final years being cared for, in a Warsaw nursing home, by Elzbieta Ficowska who in 1942, aged six months, was smuggled from the Ghetto in a carpenter’s toolbox. ‘Mrs Sendler saved not only us, but also our children and grandchildren and the generations to come,’ she said. To take this into account is to realize that the lives Irena touched cannot be counted and that, had it not been for her, the world today would be a much different place. If, like us, you believe that one good deed inspires another, starting a chain reaction of kindness, Irena’s influence is immeasurable. This is a story that we have shared for several reasons . . . .
Because Irena’s courage deserves to be applauded . . . .
Because all her efforts were rooted in compassion and kindness, for humanity’s sake and for the good of others. Extreme it might be, but this is what happens when differences and division take over, when humanity begins to break down, and when empathy, understanding and tolerance disappear. Irena Sendler saw it happening and refused to accept it without putting up a fight. Her resistance and resolve demands that we too make a stand . . . .
To come together, to recognize the common cause, to share and celebrate our connectedness. It doesn’t have to be about saving lives. Sometimes touching them is enough. Irena’s tale is one that is sure to inspire our efforts in the studio, where each OM created today will be dedicated to her. In Irena’s words, ‘I was taught that if you see a person drowning, you must jump into the water to save them, whether you can swim or not’. In ours . . . .
Sowing the seeds of love: Bob, Bogart & the bus of kindness . . . .